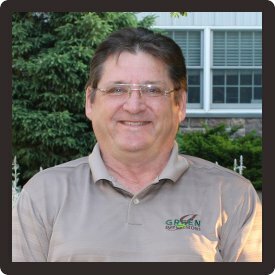 Rich is a seasoned landscape professional who owned and operated an award winning landscaping company for over 40 years before joining Green Impressions. Teaming up with his son-in-law Joe Schill, Rich brings deep experience, and specialty landscape design talents to the Green Impressions team. Rich has experience in plant installation, ponds, water features, lighting, and natural stone patios and walls. He also specializes in computer generated 3D landscape designs which allow clients to view their custom landscape master-plan in a virtual setting before initiating a project installation. Rich holds a Masters Degree in Science, Health, and Physical Education from Baldwin Wallance University.